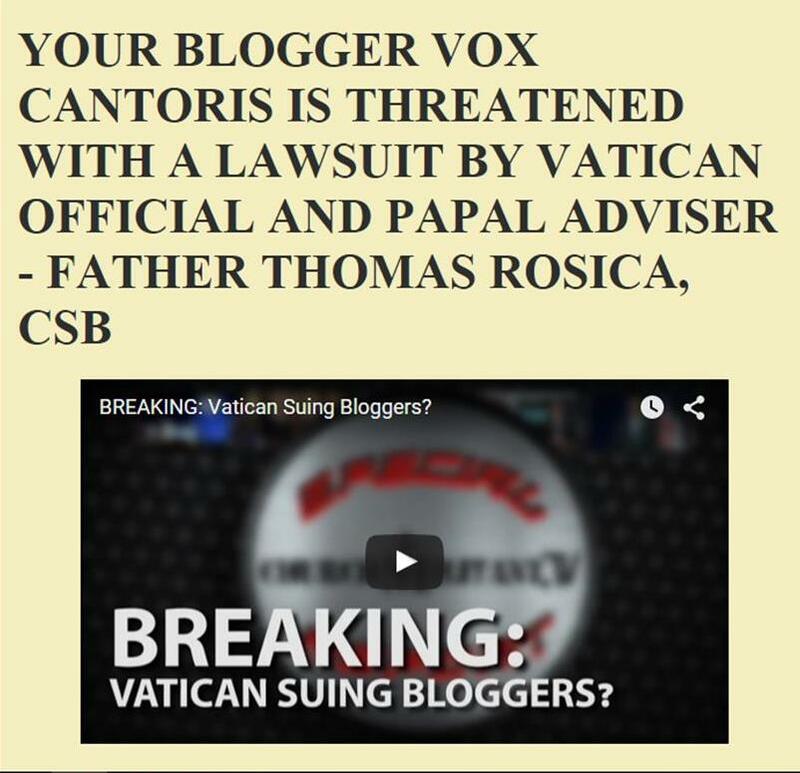 Vox Cantoris: "FILIAL CORRECTION OF POPE FRANCIS for the Propagation of Heresies"
"FILIAL CORRECTION OF POPE FRANCIS for the Propagation of Heresies"
If I could, I would sign this document in bright blue ink! This letter of correction has 3 main parts. In the first part, the signatories explain why, as believing and practising Catholics, they have the right and duty to issue such a correction to the supreme pontiff. Church law itself requires that competent persons not remain silent when the pastors of the Church are misleading the flock. This involves no conflict with the Catholic dogma of papal infallibility, since the Church teaches that a pope must meet strict criteria before his utterances can be considered infallible. Pope Francis has not met these criteria. He has not declared these heretical positions to be definitive teachings of the Church, or stated that Catholics must believe them with the assent of faith. The Church teaches no pope can claim that God has revealed some new truth to him, which it would be obligatory for Catholics to believe. The second part of the letter is the essential one, since it contains the ‘Correction’ properly speaking. It lists the passages of Amoris laetitia in which heretical positions are insinuated or encouraged, and then it lists words, deeds, and omissions of Pope Francis which make it clear beyond reasonable doubt that he wishes Catholics to interpret these passages in a way that is, in fact, heretical. In particular, the pope has directly or indirectly countenanced the beliefs that obedience to God’s Law can be impossible or undesirable, and that the Church should sometimes accept adultery as compatible with being a practising Catholic. The final part, called ‘Elucidation’, discusses two causes of this unique crisis. One cause is ‘Modernism’. Theologically speaking, Modernism is the belief that God has not delivered definite truths to the Church, which she must continue to teach in exactly the same sense until the end of time. Modernists hold that God communicates to mankind only experiences., which human beings can reflect on, so as to make various statements about God, life and religion; but such statements are only provisional, never fixed dogmas. Modernism was condemned by Pope St Pius X at the start of the 20th century, but it revived in the middle of the century. The great and continuing confusion caused in the Catholic Church by Modernism obliges the signatories to describe the true meaning of ‘faith’, ‘heresy’, ‘revelation’, and ‘magisterium’. A second cause of the crisis is the apparent influence of the ideas of Martin Luther on Pope Francis. The letter shows how Luther, the founder of Protestantism, had ideas on marriage, divorce, forgiveness, and divine law which correspond to those which the pope has promoted by word, deed and omission. It also notes the explicit and unprecedented praise given by Pope Francis to the German heresiarch. The signatories do not venture to judge the degree of awareness with which Pope Francis has propagated the 7 heresies which they list. But they respectfully insist that he condemn these heresies, which he has directly or indirectly upheld. The signatories profess their loyalty to the holy Roman Church, assure the pope of their prayers, and ask for his apostolic blessing. With profound grief, but moved by fidelity to our Lord Jesus Christ, by love for the Church and for the papacy, and by filial devotion toward yourself, we are compelled to address a correction to Your Holiness on account of the propagation of heresies effected by the apostolic exhortation Amoris laetitia and by other words, deeds and omissions of Your Holiness. We are permitted to issue this correction by natural law, by the law of Christ, and by the law of the Church, which three things Your Holiness has been appointed by divine providence to guard. By natural law: for as subjects have by nature a duty to obey their superiors in all lawful things, so they have a right to be governed according to law, and therefore to insist, where need be, that their superiors so govern. By the law of Christ: for His Spirit inspired the apostle Paul to rebuke Peter in public when the latter did not act according to the truth of the gospel (Gal. 2). St Thomas Aquinas notes that this public rebuke from a subject to a superior was licit on account of the imminent danger of scandal concerning the faith (Summa Theologiae 2a 2ae, 33, 4 ad 2), and ‘the gloss of St Augustine’ adds that on this occasion, “Peter gave an example to superiors, that if at any time they should happen to stray from the straight path, they should not disdain to be reproved by their subjects” (ibid.). The law of the Church also constrains us, since it states that “Christ’s faithful . . . have the right, indeed at times the duty, in keeping with their knowledge, competence, and position, to manifest to the sacred pastors their views on matters which concern the good of the Church” (Code of Canon Law 212:2-3; Code of Canons of Oriental Churches 15:3). Scandal concerning faith and morals has been given to the Church and to the world by the publication ofAmoris laetitia and by other acts through which Your Holiness has sufficiently made clear the scope and purpose of this document. Heresies and other errors have in consequence spread through the Church; for while some bishops and cardinals have continued to defend the divinely revealed truths about marriage, the moral law, and the reception of the sacraments, others have denied these truths, and have received from Your Holiness not rebuke but favour. Those cardinals, by contrast, who have submitted dubia to Your Holiness, in order that by this time-honoured method the truth of the gospel might be easily affirmed, have received no answer but silence. 1. "A justified person has not the strength with God’s grace to carry out the objective demands of the divine law, as though any of the commandments of God are impossible for the justified; or as meaning that God’s grace, when it produces justification in an individual, does not invariably and of its nature produce conversion from all serious sin, or is not sufficient for conversion from all serious sin." 2. "Christians who have obtained a civil divorce from the spouse to whom they are validly married and have contracted a civil marriage with some other person during the lifetime of their spouse, who live 'more uxorio' with their civil partner, and who choose to remain in this state with full knowledge of the nature of their act and full consent of the will to that act, are not necessarily in a state of mortal sin, and can receive sanctifying grace and grow in charity." 3. "A Christian believer can have full knowledge of a divine law and voluntarily choose to break it in a serious matter, but not be in a state of mortal sin as a result of this action." 4. "A person is able, while he obeys a divine prohibition, to sin against God by that very act of obedience." 5. "Conscience can truly and rightly judge that sexual acts between persons who have contracted a civil marriage with each other, although one or both of them is sacramentally married to another person, can sometimes be morally right or requested or even commanded by God." 6. "Moral principles and moral truths contained in divine revelation and in the natural law do not include negative prohibitions that absolutely forbid particular kinds of action, inasmuch as these are always gravely unlawful on account of their object." 7. "Our Lord Jesus Christ wills that the Church abandon her perennial discipline of refusing the Eucharist to the divorced and remarried and of refusing absolution to the divorced and remarried who do not express contrition for their state of life and a firm purpose of amendment with regard to it." These propositions all contradict truths that are divinely revealed, and that Catholics must believe with the assent of divine faith. […] It is necessary for the good of souls that they be once more condemned by the authority of the Church. In listing these seven propositions we do not intend to give an exhaustive list of all the heresies and errors which an unbiased reader, attempting to read 'Amoris laetitia' in its natural and obvious sense, would plausibly take to be affirmed, suggested or favoured by this document. Rather, we seek to list the propositions which Your Holiness's words, deeds and omissions have in effect upheld and propagated, to the great and imminent danger of souls. At this critical hour, therefore, we turn to the "cathedra veritatis," the Roman Church, which has by divine law pre-eminence over all the churches, and of which we are and intend always to remain loyal children, and we respectfully insist that Your Holiness publicly reject these propositions, thus accomplishing the mandate of our Lord Jesus Christ given to St Peter and through him to all his successors until the end of the world: "I have prayed for thee, that thy faith fail not: and thou, being once converted, confirm thy brethren." We respectfully ask for Your Holiness’s apostolic blessing, with the assurance of our filial devotion in our Lord and of our prayer for the welfare of the Church. Congratulations on splendid Correctio Filialis. You beat the Dubia Cardinals to the post. Just how their intended Correctio Filialis will now compare is difficult to discern, but they had plenty of time to fulfil the promise given late last year. I'm glad that ++Caffarra must have known of its delivery prior to his untimely death & one hopes that ++Burke will now follow with what the four Dubia Cardinals had intended to hand PF if accorded an Audience. Either way, the dye is cast & no longer can the heresies promulgated in AL be ignored by silence. The laity will not stand for it any longer. The name of the signee must be held accountable & we pray it won't be another year before we get some straight answers to the Dubia. I am so glad to see this. It is a start, and is very much needed before the whole Faith is lost. Sadly, this is doomed to failure. Glad it was done, mind you. But, Jorge Bergoglio is a street bully who, likely, fooled people into allowing him into the priesthood. Maybe, he fooled himself. Only God knows. But, if the man had even a nanogram of decency remaining, he would resign. I have a problem with the "Most Holy Father" part, else I'm on board. Bergoglio will ignore this as he ignored the dubia cardinals. It will be same old same old. I am glad these 62 brave souls wrote this, delivered it to Bergoglio and then published it. But I suspect that this will change absolutely nothing. it is quite apparent that the term "Holy" is not one that should be used in connection with or before any name that Bergoglio uses. There can only ever be one Pope. Any other man who calls themselves pope even if they "sit on the chair of Peter" while a true Pope lives and reigns is an antipope. Our Blessed Lord thought this when he referred to the man who builds His house on a rock (Peter) (note one rock not many) and the man who builds his house on sand. The house is the Catholic church. When Bergoglio gave authority for bishops to determine the vernacular wording of the mass in their diocese the church is no longer Catholic and the men are building a house on sand. Soon it will be time for the faithful Remnant to leave. Bergoglio knew the content of the correction before he recently put "mercy" above doctrine for us yet again. the simpletons that we are. His dismissal of doctrine has been a very consistent answer long before the questions were asked. Also, he insists that Amoris Laetita was inspired by the Holy Spirit - not by one intrinsically disordered, who likes healing with his mouth. Since none of this is a surprise for him, and we have seen him and his army of modernistic traitors of the Church doubling down on heresy, we can deduce that no significant support, but outrage and condemnation of the signatories will soon follow. He fully intends to continue with the elevation of Luther and denial of the real presence. Not only adulterers, but also practicing sodomites will enjoy a full communion with the new church. If that were not to be expected, we would not see all the firings and promotions that we are so unfortunately seeing. Yet isn't it wonderful that this correction should happen despite all of the above? but our signatures are already on there via these Holy Men. Fr Glen Tattersall signed it on behalf of the faithful Catholics in Australia. I would sign as well, many times if that weren't 'illegal', and promote signing of the correction by everyone that would listen to me. Did any Canadian priests sign this? oh yeah...he's already answered it....he's had it on his 'desk' since August 11th. Everything he's done since then has been a direct answer, most of all being the demolition of the JP II Institute for Family Life, and its remaking in his own image, loaded up with fellow heresiarchs, and dedicated to the purpose of 'teaching and promulgating Amoris Latetia'....no changes to it; no 'clarification' of it; full stop. He gave his answer, loud and clear, and he made sure to do it on the one-year anniversary of the Dubia (private) presentation. He gave a double middle finger in one fell swoop. He answered. Time (PAST time) now for the villagers to pick up the pitchforks and tar. For those of you who expressed a desire to sign this document,, please consider signing this petition in support of the 62 signatories. This petition was started by Steve Skojac of OnePeterFive. What's next when Bergolio remains silent and/or takes action against these disloyal and disobedient "catholics?" Well done, Vox, on this post. Rorate Caeli says this is but Step 1. What this means is that if the Pope ignores this there will be a Step 2. Step 2 is a Canonical procedure. That is why Step 1 is called both 'Formal' and a specific historical thing - a 'Filial Correction'. Step 2 will probably consist of some Formal Fraternal Canonical warning that if the Pope does not correct his doctrine and bullying behavior the Seat will be declared empty. After a fair period of time, Step 3 will be where Cardinals and/or bishops, who took Step 2, will declare the Chair of Peter empty due to pertinacity - that means being stubborn. This can be, not because they can depose the Pope (they can't) but they can determine that the Pope has removed himself from the body of the Church - so it ends up the same - the Chair is empty. Then Step 4 follows immediately - those bishops elect a new Pope - even if Francis and most people do not accept it. Congratulations to the 62 individuals who signed this document. May God Bless them. I am sure it wasn't easy putting their name on it for some of them. This is indeed the first step. Let us not be dismissive of it! Kudos to them for keeping to social decorum and affording our Pontiff the respect he deserves, by virtue of his title. None of us are holy until we die and go into Heaven, if we live lives attuned to God on Earth. Francis is the Pope - and the only Pope, for that matter. Pity Josef Ratzinger didn't sign it. Ah, well, perhaps in time. P.S. Vox, you've been signing your name in bright blue ink for how long now? James....I think that maybe some of the clergy are waiting for the FRATERNAL Correction. (that is to come after this) Why some of the clergy signed this one, I don't really know, but am glad for all that did. Logic tells me that the FILIAL Correction is basically and for the most part by laity, and FRATERNAL is by clergy. Someone correct me if I'm wrong. Fr. Z seemed to clear some things up and said that this is a 'long process' and that this Filial Correction is just the beginning. He kind of implied that we have a long road ahead. In the meantime, keep those Rosary beads going!! These signatories are going to need all of our prayers and sacrifices. The KNIVES are already out for them, from what I am hearing the Jesuits are 'gathering information' on them. It's very important to pray for their safety! Oh, and the people who are doubting the 'effectiveness' of the Correction, it may very well be ineffective, but, that's not what God looks for. The Correction could very well fall on its face, but it's the FAITHFULNESS in defending Christ and His Church that Christ is looking for. This was a very valiant effort in defense of Christ! It's what really counts in His eyes. Okay! I signed the petition per Ana Milan's link. I can hardly wait to get my Writ of Excommunication from the Novus Ordo Church in my email. This is so exciting!!! And then they will elect another modernist and you are back to square one. Do you really expect a return to tradition to come from the sewers of the NO V2 seminaries? The only product formed in those cesspools are sodomites. Good! About Time! Everything is in Almighty God's Perfect Will! This is an excellent first step in the process of removing The Hireling. We are dealing with something here which is very strong, and very very devious. Far more strong and far more devious than anything which we are ever likely to confront. This is an existential struggle. We are going through a process. A process which will be protracted. A process which will take great fortitude and great faith to endure and see through the completion of this process. Every "i" must be dotted, and every "t" must be crossed, in this process. And even then the source which energises The Hireling will rail against the Truth. Because It hates Truth. Sign the petition of support on OnePeterFive website too. I have publicly added my name to the "Filial Correction" of Pope Francis.As a priest, I am very disturbed by the confusion that has been spread within the Catholic Church during the last fifty years. And I am very disturbed that Pope Francis has added further bewilderment and confusion, amongst the poor Faithful, by his refusal to clarify so many of his heretical remarks - both oral and written. In an age of divisiveness, I am deeply grieved by Pope Francis' abdication of his most essential of duties, that is, his moral obligation to preserve, defend and promulgate the Truth of the Catholic Faith. LifeSiteNews has a petition for the laity worth signing. The Correctio has delivered an accurate and truthful rebuttal of Pope Francis spoken statements and written statements. Even if Francis repealed and rescinded AL, this papacy is finished.